David Hajdu and Renee Rosnes have released Ice On The Hudson, their first co-written album-length recording. In casual conversation, artists might reveal their struggles with complacency, particularly when they feel they’ve already established their sound. 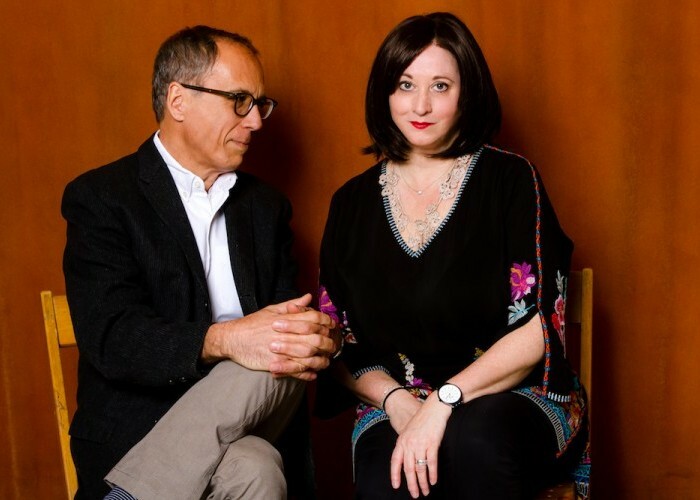 Separately, pianist and composer Renee Rosnes and writer David Hajdu have spent their careers defying complacency, living in possibility. And together, they developed Ice On The Hudson, an SMK Jazz release that reflects two years of creative output and two temperaments of creative inquiry. Though the two never had met, Hajdu approached Rosnes about five years ago to ask if she might be interested in writing songs. Rosnes responded enthusiastically. From that exchange, a partnership between composer and lyricist emerged. “Everything clicked,” said Hajdu, whose past projects have included lyric-writing for Fred Hersch and Jill Sobule. He’s also a music critic for The Nation and teaches at Columbia Journalism School in New York. Then the partners lined up personnel whom they felt would honor the musical and lyrical complexities presented in their work, including reedists Seamus Blake and Ken Peplowski, and vocalists René Marie, Janis Siegel, Darius de Haas and Karen Oberlin, among others. Hajdu identifies as a consummate scholar of the music. Musing over Lorenz Hart and Dorothy Fields, he lamented that today’s music has lost what he considers to be a sophisticated degree of care and precision. In co-creating Ice On The Hudson, Hajdu tasked himself, along with Rosnes, with bringing those elements back into the music. “I wanted to hear more songs that have the level of craft, meticulousness and deep musicality of the standards—but with a 21st-century orientation,” he said. Both artists describe each other’s work as layered, and accordingly, their record intercuts themes of longing, tenderness and renewal. “Certainly the emotion of the lyric plays a role in the arrangement of the pieces,” Rosnes said. On “Little Pearl,” the conversation between Erik Friedlander’s cello and Rosnes’ piano was a deliberately evocative choice by the pianist, who wanted to conjure the sensation of viewing Earth from outer space. With four exceptions, each song followed the same format for composition: Hajdu would write lyrics first and develop a “dummy” form—one Rosnes never wanted to see or hear. She would take only Hajdu’s lyrics, composing music around his words. “The Passage” and “Little Pearl” derived from original instrumental compositions, but Rosnes wrote “Confound Me” and “All But You” specifically for Hajdu to complete. Despite Ice On The Hudson being her first album-length project co-written with a lyricist, Rosnes dismissed any sense of apprehension. Instead, she attributes her exhilaration to the freedom the pair enjoyed during the process.